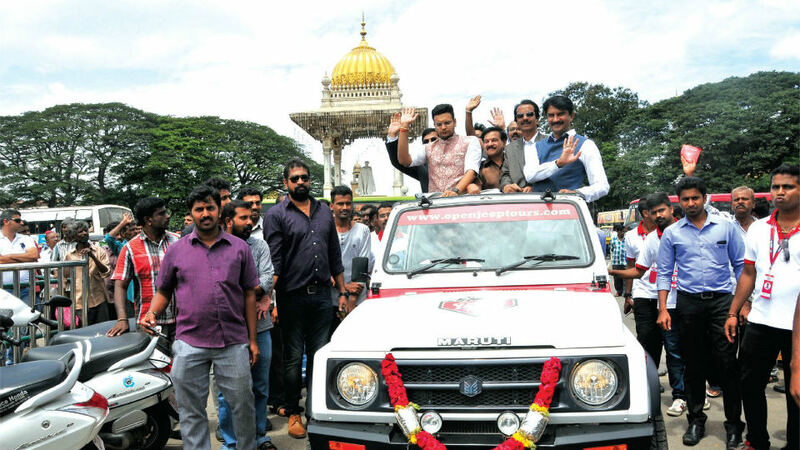 Mysuru: To attract visitors during Dasara festivities, ‘Open Jeep Tour’ was launched by Yaduveer Krishnadatta Chamaraja Wadiyar yesterday. The tour enables a visitor to take an enchanting jeep tour when the city comes alive with pomp and revelry. They will also get a chance to learn more about the illustrious tradition of Mysuru and its significance in the cultural history of the State. Speaking on the occasion, Yaduveer said that in every corner of Mysuru there is a story. The Open Jeep Tour will help the visitors get an in-depth knowledge and story of the city. Former Minister and BJP leader S.A. Ramdas, MLA Vasu, Mysuru Travels Association President B.S. Prashanth and others were present during the launch. The tour is operational twice a day and throughout the year and two scheduled trips per day will be conducted, each for two hours. The schedule tours are arranged as per the group requirement. Each jeep can accommodate a maximum of six travellers and the starting point is Lalitha Mahal Palace Hotel and culminates at Mysore Palace. The tour will cover all heritage destinations like Lalitha Mahal Palace, Administrative Training Institute, Chamundi Hill View Points, Mysore Race Course, Government Guest House, Wellington House, Clock Tower, Freemasons Club, Town Hall, Gandhi Square, Devaraja Market, Dufferin Clock Tower, K.R. Circle, Lansdowne Building, Mysuru City Corporation, Gun House and Jayamarthanda Gate of Mysore Palace.